.....that A.C.Milan, one of the two major football teams in Milano and the one owned by Berlusconi, was originally called the Milan Foot-Ball and Cricket Club! 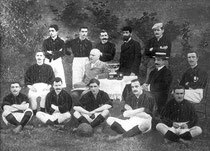 It was thus named by the two British expats, Herbert Kilpin and Alfred Edwards, who began the club on 16 December,1899. Hence the city being called "Milan" instead of "Milano" in the club's name.